■ To indicate briefly: press the combination switch briefly to the pressure point in the direction of arrow 2 or 4. The corresponding turn signal flashes three times. ■ To indicate: press the combination switch beyond the pressure point in the direction of arrow 2 or 4. 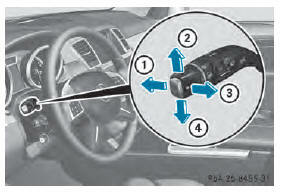 ■ To switch on the high-beam headlamps: turn the SmartKey in the ignition lock to position 2 or start the engine. ■ Press the combination switch beyond the pressure point in the direction of arrow :. headlamps are only switched on when it is dark and the engine is running. instrument cluster lights up when the highbeam headlamps are switched on. 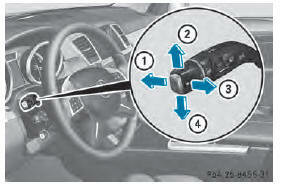 ■ To switch off the high-beam headlamps: move the combination switch back to its normal position. Vehicles with Adaptive Highbeam Assist: when Adaptive Highbeam Assist is active, it controls activation of the high-beam headlamps . 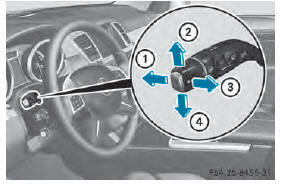 ■ To switch on: turn the SmartKey in the ignition lock to position 1 or 2 or start the engine. ■ Pull the combination switch in the direction of arrow 3.